Sarah A. Lewis is a Reference Librarian and Professor of Legal Research at University of Florida Levin College of Law in Gainesville, Florida. Sarah teaches Legal Research, a course focusing on teaching students how to research statutory and case law on both a state and federal level. Sarah received her Juris Doctorate from Vanderbilt Law School in Nashville, Tennessee, and her Master of Library and Information Science and Master of Science in Knowledge Management from Kent State University in Kent, Ohio. 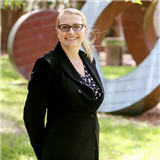 Prior to becoming a law librarian, Sarah practiced corporate and public finance law in Atlanta, Georgia.